Barcelona webcams show you live pictures and views of Barcelona, the second largest city of Spain. A webcam is short for web camera. These digital cameras have been set up in fixed locations throughout Barcelona enabling anyone to view live streaming video and images of the city of Barcelona at any time of day. There are many reasons people like to look at webcams – they may want to see the latest weather conditions (we have a weather forecast below) or they may want to see what sights and attractions there are in the city. Barcelona is one of the great European cities – this lively Mediterranean port city is Spain’s second-largest and is capital of the Catalonia region of north-east Spain. It has an incredible mix of unique architecture, historic monuments, museums and even beaches. There are just so many sights and attractions such as the Aquarium, Zoo, Maritime Museum and Barcelona Football Club (Nou Camp) to name just a few. You can catch a cable car to the fortress-topped hill of Montjuic. In this area the 1992 Olympic Stadium and some fine museums are located (Fundacion Miro & Museu Nacional d’Art de Catalunya). The tree-lined boulevard Las Ramblas runs through Barcelona from the port to the Placa de Catalunya. Here you will find crowds watching the many street entertainers. Explore the underground Roman ruins at the Museu d’Historia de la Ciutat. Relax at the Placa del Rei, a beautiful square. Visit the famous medieval Gothic Quarter (Barri Gotic) and see the Cathedral as well as the El Arco de Triunfo and the Palau Aguilar (Picasso Museum). The Port Vell area is the attractive marina with bars, restaurants, cafes, shops and the aquarium. The fishing district of Barceloneta has some great beaches and seafood restaurants as well as the Museu Maritime. The famous Sagrada Familia church in Barcelona as designed by Gaudi – this is one of the most famous tourist attractions in the world and is situated on the Carrer de Mallorca in central Barcelona. This famous church began construction in 1882 with the architect Francisco de Paula del Villar originally designing a neo gothic church. One year later Antoni Gaudí took over as the chief architect and from that moment he radically changed the design. Gaudí spent most of his life obsessed with the building of the church until his death in 1926. At that time only one tower was completely finished out of a planned 18 towers. Although still a work in progress the church is an amazing visual feast. Gaudi himself is buried in a crypt here and the views over Barcelona are magnificent. 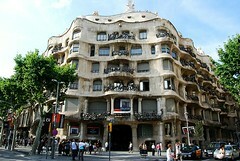 It is expected that Antoni Gaudi’s masterpiece will be completed in 2026. You can also visit the Sagrada Familia Museum which is located inside the church and documents its fascinating and troubled history with a good explanation behind the thinking and objectives of Gaudí’s work. Make sure to see his other buildings such as the Casa Mila (La Pedrera) with its unusual lines and surreal chimneys – see picture below – as well as the Park Güell. Just click on the links to see live webcams of Barcelona. Traffic webcams of Barcelona – This is a great site – it has 27 webcams of Barcelona. 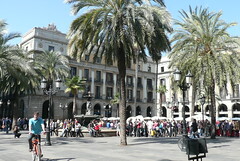 The webcams are of roads and famous tourist sites in Barcelona such as Las Ramblas. Las Ramblas Webcam – The Le Méridien Hotel located on the famous boulevard in Barcelona broadcasts live images with spectacular views of the city as you can see above. Use the price comparison website search engine below to quickly find the cheapest car hire from Barcelona Airport. Within seconds we give you the lowest quote for hiring a car from Barcelona Airport. The price comparison search engine below will compare all the current Barcelona Airport car hire deals and car rental rates to give you the lowest and cheapest car hire deals from Barcelona Airport. Our popular area guides on the Costa Blanca, Costa del Sol, Costa Almeria and Costa Calida. You may want to rent a car as cheaply as possible. Find a job in Barcelona. If you have never been to Barcelona and want to see what Barcelona looks like then Barcelona webcams are ideal to get a flavour of Barcelona.